This is just a word about it from a Gold Star mom – whatever it takes, people. On July 26, 1920, the acerbic and cranky scribe wrote in The Baltimore Sun: " . . . all the odds are on the man who is, intrinsically, the most devious and mediocre — the man who can most easily (and) adeptly disperse the notion that his mind is a virtual vacuum. The presidency tends, year by year, to go to such men. As democracy is perfected, the office represents, more closely, the inner soul of the people. We move toward a lofty ideal. On some great and glorious day, the plain folks of the land will reach their heart's desire at last, and the White House will be adorned by a downright moron." My late good buddy Leon Daniel, a wire service legend for 40 years at United Press International, dredged up that Mencken quote several years ago and found that it was a perfect fit for George W. Bush, The Decider. MSNBC's Keith Olberman highlighted the same quote this week. A tip of the hat to both of them, and to Mencken. He inherited a balanced budget and a manageable national debt, and in just over six years has virtually bankrupted the United States of America and put us in hock to the tune of nine trillion dollars — a sum larger than that accumulated by all the 42 other presidents we had in two and a quarter centuries. Although he titillated the Republican conservative base with talk of his opposition to big government, Bush has presided over a far more grandiose expansion of government than even Franklin D. Roosevelt with his New Deal. Faced with the tragedy of the 9-11 terror attacks — due in part to a dense and impenetrable federal bureaucracy which didn't know what it knew and wouldn't have shared it if it had known — the president created a far denser, far less efficient and far more expensive mega-bureaucracy, the Department of Homeland Security. 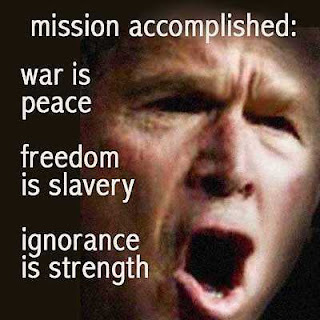 Having made one good move, attacking and toppling the Taliban and running al Qaida and Osama bin Laden out of Afghanistan in retaliation for 9-11, the president and his crowd then turned away, half-finished with Job One, and decided to "pre-emptively invade" Iraq, which had precisely nothing to do with the attacks on America. The mills of the military-industrial complex went into high gear, as the defense contractors jostled for their places at a trough filled each year with half a trillion dollars of taxpayer money. The Republican political operatives milked them all like so many Holstein cows and the Republican lobbyists romped over to Capitol Hill buying congressmen by the baker's dozen to keep the pumps primed. When one raison du jour for the war in Iraq failed — and all have failed — President Bush and his general-of-the-month could always come up with another to appease the gods of war and keep the machinery turning. And by the way, regarding this story, Dubya, try listening to Sen. Charles Grassley (assuming a pine cone like you has enough of a brain to process the information he’s trying to communicate). And finally, here’s a reminder about why all of this matters. How Exactly Is Jim Moran Wrong, Steny? More From "The Most Trusted Name In News"